These are 25 of the most important things you need to know about Deadpool (not just what was in the movie), so you look knowledgeable when repping your Marvel cred. Getting into a new property can be daunting, especially when it’s based around a character who routinely breaks the fourth wall, is subject to almost yearly retconning, and whose best stories are spread out at seemingly random intervals across 20 years of comics, guest spots, and team-ups. For the most part, we whittled down the more complex information about Deadpool (i.e. anything time travel related). After reading this list of must-know Deadpool facts, you’ll be ready to dive into the world of Wade Wilson, and you’ll be winning Deadpool trivia contests like it’s what you were put on this world to do. He may also be pansexual or omnisexual, depending on who you ask. Deadpool NOW writer Gerry Duggan tweeted he considers Wade "ready & willing to do anything with a pulse." When Deadpool was first developed, he has such a striking similarity to DC’s Deathstroke that his creators (Fabian Nicieza and Rob Liefeld) decided to name him Wade Wilson as an inside joke as a result of the correlation. The name implies a relation to Slade Wilson aka Deathstroke. Yeah, the Merc with a Mouth plays at least one MMORPG, as evidenced by his reference to Leeroy Jenkins, a Warcraft character who famously shouted his own name while rushing into battle. How does Deadpool have time to play World of Warcraft?! He's supposed to be saving the world, not grinding for gold. Odd as it may seem, Cap is pretty much the only guy in the Marvel Universe who actually likes Deadpool. And Cap is the only person whom Deadpool respects. As a child, Captain America was Wade's idol. 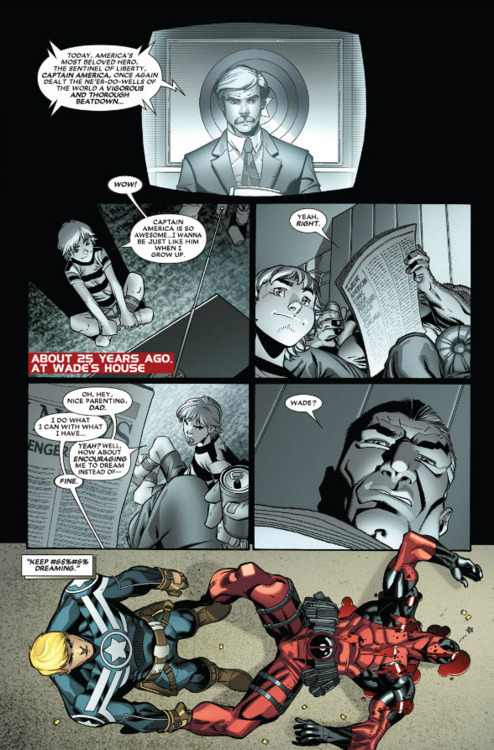 Since they're both government experiments, he's one of the few people who can understand Deadpool's pain.